I loved the Mass readnigs for today: Jer 23:1-6, Ps 23:1-3, 3-4, 5, 6, Eph 2:13-18, Mk 6:30-34. 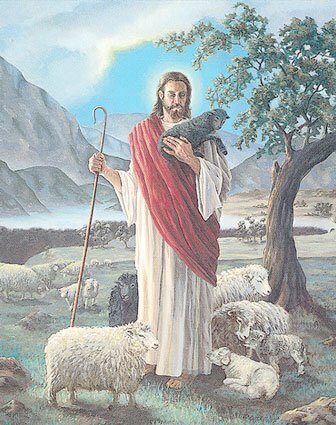 One of my favorite images of Christ is Christ the Shepherd. In fact, when I think of Christ, that is more times than not the image that comes into my mind. I have a photo right above my desk here of Jesus holding a lamb in his arms. I like to look at it when I’m uneasy about something or when I just need to take a step back. And so I was glad to see these readings, with such a heavy emphasis on Christ the Shepherd. I felt like we were back in the Easter season on Good Shepherd Sunday! I sat in the church yesterday evening MC’ing for Fr Bill and, during the psalm, just felt at peace. I closed my eyes and knew that where I’m going, is where Christ the Shepherd is leading me. I sat there and pondered the readings as I listened to them. During the first reading, I couldn’t help but be grateful that God has put such great shepherds in my own life and in the life of our Church. We have a great Pope! We have great priests! I have great parents and family! And I’ve had great teachers! Unlike so many, I have not had to suffer much under the neglectful shepherds. And during the second reading, I called to mind the times I have been “far off”. As St. Paul says: “Brothers and sisters: In Christ Jesus you who once were far off have become near by the blood of Christ.” How many times I wander away from the gentle arms of our Lord. But our loving Shepherd, in order to bring us to the Father, died that we might have the sacraments. The Blood of Christ brings us to God–and God to us. A fitting line for this, the month of the Precious Blood. And then the Gospel made me rest. It’s easy to feel busy, overburdened, and uneasy about life. But our God, Christ the Shepherd, brings us to peaceful rest when we need it, as if to strengthen us to go back out there and do it again…but better. Tonight at our apologetics Bible Study, which I hope to share more abotu later, the topic was the sacraments and apostolic succession. In talking about the bibilcal basis for Holy Orders and the Papacy, I started by sharing some places in the Bible that talk about our need for a shepherd. Like today’s readings. And some areas that not much attention is paid to, such as the Books of Habakkuk and Nahum. Without a shepherd, we look inward and, in a sense, make ourselves out to be God: we decide where we want to go, which Catholic beliefs we like and align with our feelings, what we will do with our lives, etc. Notice all the first person pronouns here! That’s my bone to pick with cafeteria Catholics. If Jesus is your shepherd, you need to have so much faith and trust in him that you surrender, completely. Don’t fight Holy Mother Church, because then you’re fighting Christ. And here’s a hint: he always wins. In the end, Christ the Shepherd loves us and shows us the way. and proven on the wood of the Cross. Help us to hear and follow Your voice. retrieve the lost and bring them home, especially __. Tend and heal the wounds of all the suffering and sick, especially __. and enjoy the spring of Living Water that never ends. This entry was posted in Bible, Prayer, Reflections, Sacraments, Vocations. Bookmark the permalink.